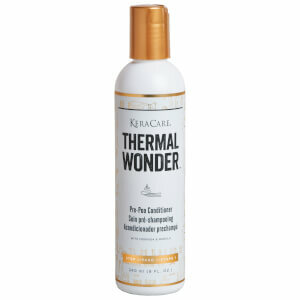 Treat your hair to the nourishing properties of KeraCare Thermal Wonder Pre-Poo Conditioner, an intensely hydrating treatment that has been specially developed to be used prior to shampoo. Preparing hair for cleansing and thermal styling, the pre-cleanse conditioner contains a host of fresh botanical extracts and moisturising ingredients, including Moringa and Marula, and penetrates the hair and scalp to refresh, revitalise and rejuvenate. The 10-15 minute treatment infuses hair with beneficial extracts, hydrating and detangling to help reduce damage and breakage when combining. Vitamins, Menthol, Aloe Vera, Green Tea work in synergy to invigorate and protect hair and scalp. Hair is left feeling soft, replenished and moisturised. Can be used as an intensive overnight hair mask. The first step in your Thermal Wonder™ routine. Apply liberally to your hair while dry, before shampooing. Carefully comb through to saturate hair and for even distribution. Cover hair with a plastic cap and leave on for 10-15 minutes depending upon how dry or oily your hair condition; longer for dry hair. Rinse thoroughly with lukewarm water and follow with the Thermal Wonder™ Cream Cleansing Shampoo. Note: For a more intensive moisturising treatment, you can leave it on your hair overnight.